By Xah Lee. Date: 2016-05-24 . Last updated: 2016-06-06 . 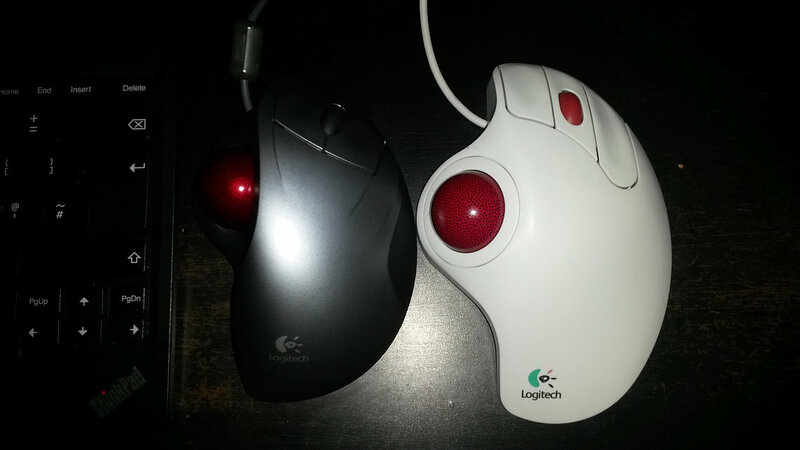 Logitech TrackMan Marble Wheel came out in 1999, and is the best selling trackball. It went thru several revisions in the past decade. 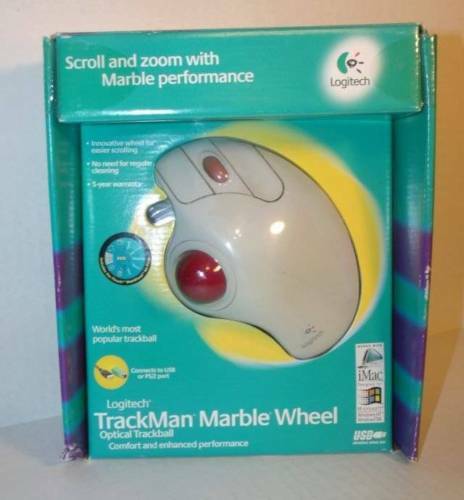 Logitech Trackman Marble Wheel optical trackball, 1999, box. Here's amazon's own review about it. It's history. It might not prevent or cure repetitive stress injuries, but the Logitech TrackMan Marble Wheel is still pretty comfortable and easy to use. This odd-looking trackball is thumb operated and is both Mac and PC compatible, making it a great choice for anyone in search of a better mouse. Unfortunately for lefties, this one is strictly for right-handed users. Installation of the TrackMan Marble Wheel is a no-brainer. Simply install the drivers and plug the mouse into either a free USB or PS/2 port using the supplied adapter. If you do opt for the USB connection and you use a PC, be sure to have your Windows 98 CD handy, as you'll need it to load drivers. 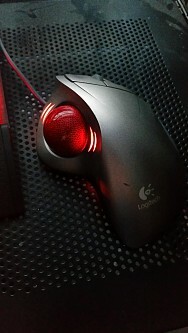 As soon as you've installed the mouse, you can configure it using Logitech's MouseWare software. For those who are either used to a traditional mouse or who have used a finger-operated scroll wheel, the TrackMan Marble Wheel may take some getting used to. As the thumb generally is not the most dexterous of the five digits, you may find it hard at first to actually get the cursor to point to the right icon. But after about a day, we found that this mouse felt more natural to use. The only issue we have with the mouse's construction is its scroll wheel. The wheel is very tight, which makes scrolling through Web pages or long documents rough. 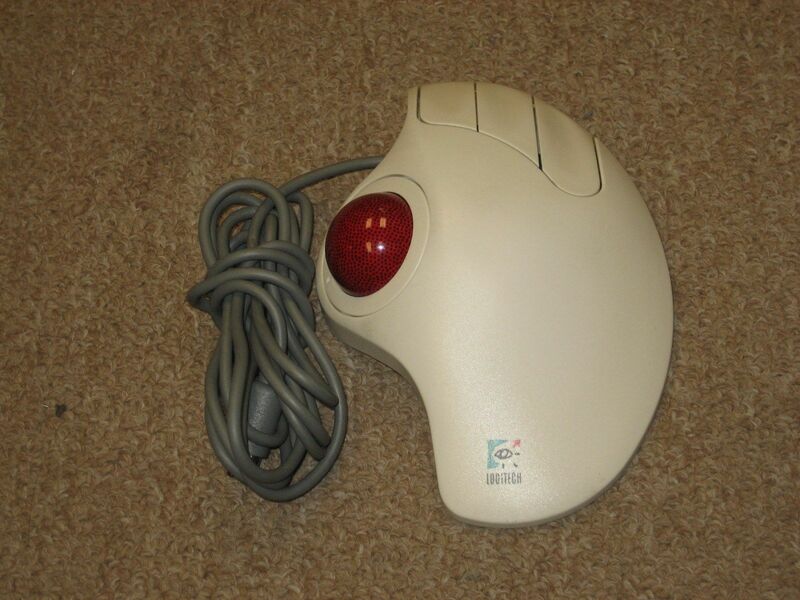 Unless you're extra comfortable with using a trackball and you've mastered pointing with your thumb, don't try using this mouse for gaming. Getting the mouse to actually aim accurately at your target is a chore, and you'll find you've been fragged in that Unreal Tournament death match before you know what hit you. But if gaming's not your bag and you're in need of a superior trackball, the Logitech TrackMan Marble wheel is a nice choice that's sure to last you a few seasons. Earlier version doesn't have the scroll wheel. Samuel GART, Plaintiff-Appellant, v. LOGITECH, INC., Defendant-Appellee. Also, here's a article about how to modify it to change connector from PS/2 to USB. Silver Logitech Trackman Wheel, came out in 2001. Logitech Trackman Marble came out in 2004. 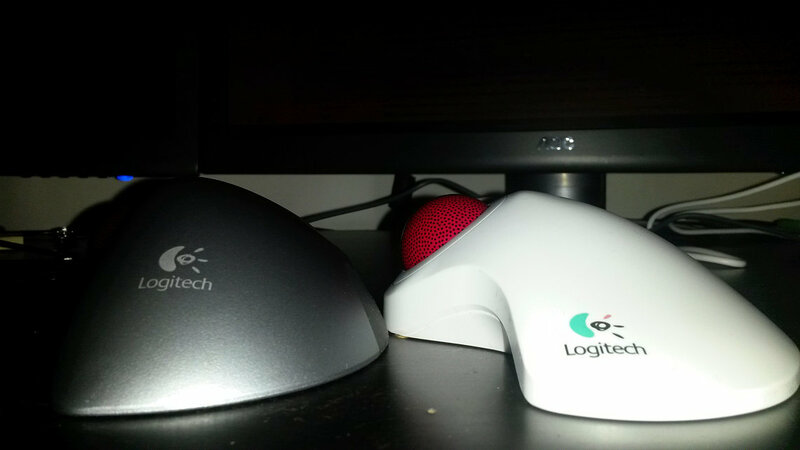 Logitech M570 Wireless, came out in 2010.